When someone you love dies, Earl Grollman writes, "there is no way to predict how you will feel. The reactions of grief are not like recipes, with given ingredients, and certain results. . . . Grief is universal. At the same time it is extremely personal. Heal in your own way." 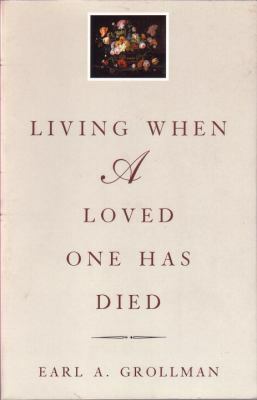 If someone you know is grieving, "Living When a Loved One Has Died" can help. Earl Grollman explains what emotions to expect when mourning, what pitfalls to avoid, and how to work through feelings of loss. Suitable for pocket or bedside, this gentle book guides the lonely and suffering as they move through the many facets of grief, begin to heal, and slowly build new lives. Used Good (5 available) Shows some signs of wear, and may have some markings on the inside. 100% Money Back Guarantee. Shipped to over one million happy customers. Your purchase benefits world literacy!